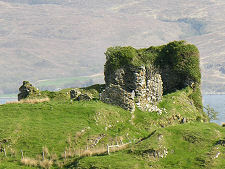 Knock Castle occupies a rocky headland projecting into Knock Bay on the coast of Skye's Sleat peninsula just over four miles north east of Armadale. 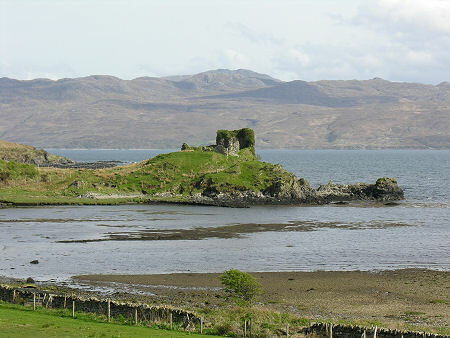 The castle is also known as Caisteal Uaine or Caisteal Camus and is seen to its best advantage from beside the recently upgraded A851 which now sweeps past the landward side of the bay. From here the castle stands out against the Sound of Sleat in the background, the scene completed by the rugged landscape of Knoydart in the distance. 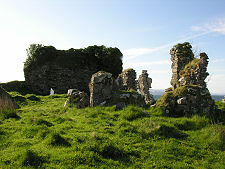 There are no signposts directing the visitor to Knock Castle, but it is accessible on foot. 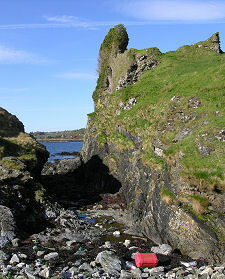 The final stretch of path follows the southern side of a small river which disgorges into Knock Bay close to the castle. You pass what appears to be an old boatshed, then climb a grassy slope that levels off when you reach what is left of the castle itself. A word of warning: there are sheer drops on two sides of the castle, and bits of the remaining stonework look ready to drop off - or onto your head - at the slightest provocation. If you do decide to explore the castle, take great care. 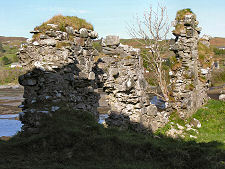 What you find are the fairly slight remains of several different parts of the castle. 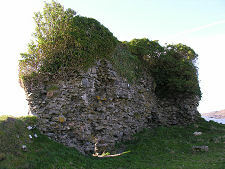 The bulkiest wall stands at the southern side of the site and seems to be part of a keep dating back to the 1400s. A visitor in 1907 found traces of foundations which suggested the keep originally measured 55ft long by 26ft wide: he also described the surviving keep wall as being 30ft high, which suggests it has lost a fair bit in the intervening century. The far, western, side of the castle carries walls that seem to belong to a range built in the late 1500s, apparently at right angles to the earlier keep. It seems reasonable to suggest that the two ranges occupied two sides of a courtyard, the east and north sides of which were enclosed by a curtain wall. There is evidence that the landward approach to the castle was cut with a ditch to make it harder to attack from this side. 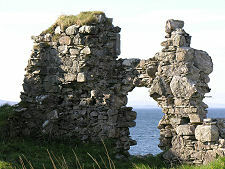 The other sides of the castle were protected by the sea, especially to the south east, immediately beyond the keep. 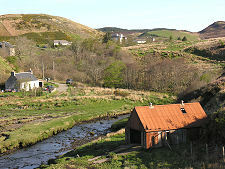 This side can be best viewed by following grassy slopes back the way you came, and then down to the right to the shore. This reveals a cleft in the natural rocks that presents a sheer rock face to anyone approaching from this side. It also forms what might have been a protected harbour that could be used by the residents of the castle. 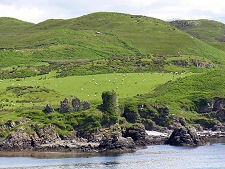 The site now occupied by the castle was originally the site of an Iron Age fort, Dun Thoravaig. By the 1300s the first castle built here seems to have been the property of the MacLeods. 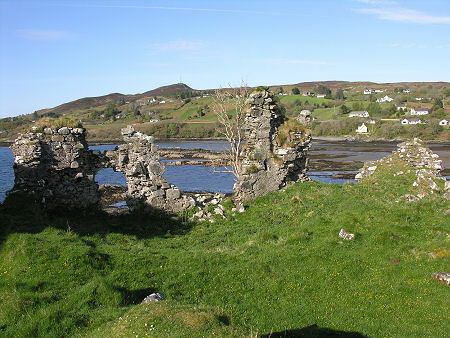 In the early 1400s control of the castle and of the Sleat peninsula more widely was seized by the MacDonalds. They probably built the keep whose remains you can see today. In 1431 the castle was captured by the forces of James I who was seeking to impose his authority on the Lords of the Isles. 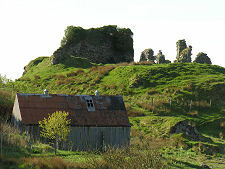 Alasdair Crotach MacLeod, the 8th Chief of Clan MacLeod, tried and failed to recapture it in the early 1500s, and it remained part of the MacDonalds' estates until abandoned during the 1600s to become a quarry for other building projects in the area. The only residents these days are said to be two ghosts, one of a Green Lady, the other a spirit that cares for cattle. How the latter feels about the Highland cattle that once thrived on Skye having been largely being displaced by sheep in the last couple of centuries is not recorded.